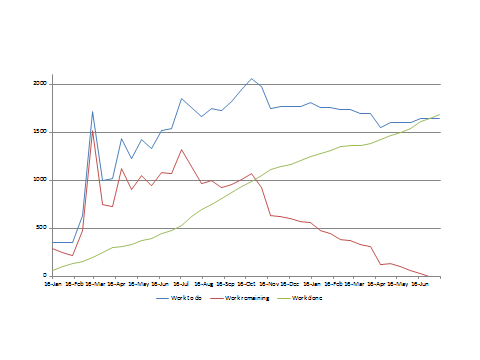 This chart shows a bunch of really interesting things. For example, we base-lined the requirements around the end of April in the first year, but up until that point there had been erratic scope growth. This was natural enough, as you go through the discovery process. You see that big early spike? That was the wish list of the stakeholders. The following trough is the push back as management – the people paying for the system – sought to shrink the project cost and risk. 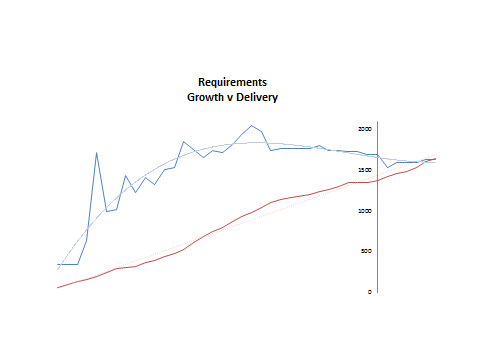 You’ll also see that once base-lined the requirements scope still went through some weeks of erratic growth and shrinkage. This reflects the continuance of that negotiation process between the people who had to use the system and the ones paying for it. Eventually a combination of sufficient negotiation and sufficient product being visible meant the scope changes flattened out. We even reached a stage where we were successfully negotiation the scope down as we discovered some redundant requirements, and were able to show how some requirements were not as critical as originally thought. At the end of the day we came through at just over 2% scope growth per month, and had I continued to work with the product and team I would have seen the average scope change rate become even lower. 2% is industry average remember? But it was way lower than common in this context. By the way, we missed the target deadline on this project, but were able to tell management many months ahead of time. There were no last minute surprises. And as an organisation we had not just beaten the odds to deliver a successful product, but had learned many things that can help future projects. Yamo, Thanks for the question. 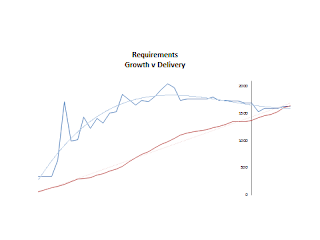 I was tracking via excel, although every requirements management tool I have seen has the ability to generate the same data. I will elaborate in the next few posts.